This exciting fish tale is a musical marine epic about a guitarfish and his awesome band of sea creatures trying to tour without getting hooked by humans. Jimi Fin Licks leads The Flow on dangerous excursions in open water and on an eventful aquarium tour that ultimately relays a preservation message. The Flow hit the big time with the fun-key tune “Blue Is the New Green.” Millions get the message when The Flow performs its oceanic anthem at a huge festival in New York called Fishstock! Cap’n Less is the pen name for author Jimmy Leslie. He is the former editor of Gig magazine, and a veteran contributor to Guitar Player and Bass Player magazines. He’s interviewed everyone from Jack White (White Stripes) to Bootsy Collins (James Brown, P-Funk). Collins provided the forward for Guitarfish Adventures: Volume 1.0: Blue Is the New Green, Leslie’s first work of fiction. Collins says: “I dig Guitarfish Adventures because it has two messages that are very important to me. First, that funky music is an expression of one's true self. It embraces the haves and the have-nots to create a fun environment with the understanding that being different is cool. I’m honored to be the inspiration for Shugga the Manta Ray—the baddest bass plucker in the big blue sea! The second and equally important note is that blue is indeed the new green. It’s time to pay equal respect to all creatures—on land and underwater. We need to leave the world as funky as we found it for future generations.” Donald Ritter is the owner of Category 5 Amplification, a company that donates a portion of its proceeds to Gulf Coast restoration. He says: “My 8-year-old daughter and I took turns reading pages and finished Guitarfish Adventures in about 20 minutes—perfect for a bedtime story. It was fun and engaging. Grace got the message that “Blue Is the New Green,” and now has a whole new vocabulary about sustainable fishing, and environmental awareness. She was intrigued with the characters, and enjoyed the musical references as well. The first thing she wanted to do was have Jimi Fin Licks sign her guitar. Six months later, she had full recall of the story, and the message. 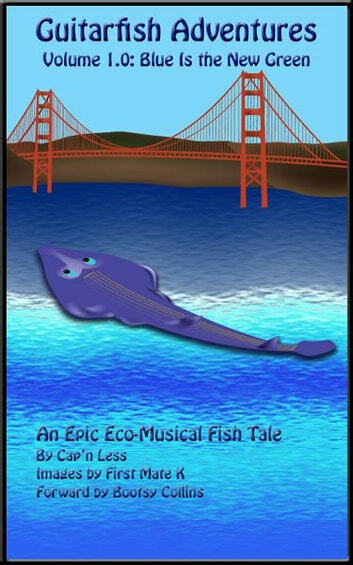 I highly recommend this story to any parent who wants to spend a fun and informative 20 minutes with their child.” Guitarfish Adventures has already inspired a major music festival in California. The Guitarfish Music Festival kicked off in September of 2011 with 30 bands playing over three days at luscious Cisco Grove Campground, and it celebrated the publication debut of Guitarfish Adventures Volume 1.0: Blue Is The New Green. The Guitarfish Music Festival took its family friendly vibe and environmental theme from the book, making it the first “blue” music festival. 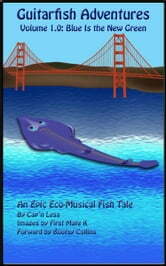 Author Jimmy Leslie played with his band The Flow—named for the band in Guitarfish Adventures. He also performed as Cap’n Less bringing Guitarfish Adventures to life for thrilled audiences of children. As Cap’n Less, Leslie will be touring venues such as aquariums and marine theme parks to promote Guitarfish Adventures. Check www.guitarfishadventures.net for dates in your region. National Geographic Kids Chapters: My Best Friend is a Dolphin!